I don’t like politics, and I don’t like voting. When I turned eighteen years old, I didn’t celebrate by getting registered to vote and participating in the presidential election the very same year. 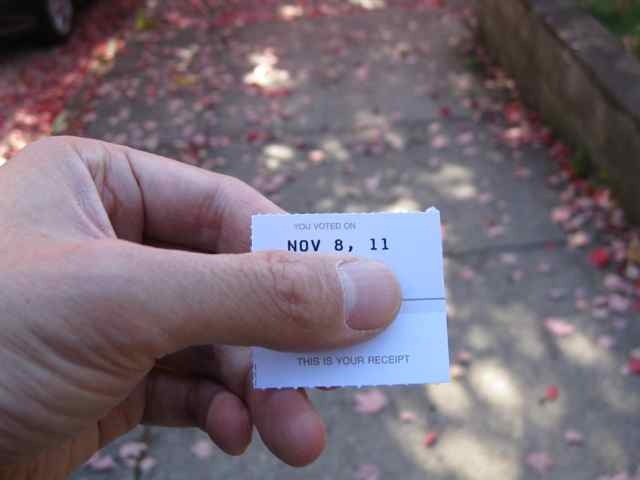 The first time I ever voted, I was twenty-two. In recent years, I have been voting almost every chance I have. Overall, I don’t know exactly why. I know all the arguments for voting: it’s my civic duty, I can’t complain about what politicians do if I’m not involved in selecting them, etc. I also know all the arguments against voting: what difference do I make anyway (empirically, the vast proportion of the time, whenever I vote for someone, that person loses), why should I vote for someone I find loathsome, why should I vote for someone who is going to do a lot of things I oppose, etc. What is actually at stake? In the end, it seems to me that what is at stake is often purely personal gratification. People like to feel good about themselves, by imagining that they are doing their civic duty or that they are “sending a message” by refusing to compromise. There is another perspective that I used to strongly dislike: voting as choosing a “lesser evil”. Once framing voting as an unpleasant task, with low expectations, it’s easier to hold your nose and do it. Of course, there are arguments against “lesser evilism”: because the American political system is completely broken, captured by lobbyists, and unfriendly to third parties, choosing a lesser evil narrows debate and does nothing to encourage politicians to adopt alternative points of view outside the narrow bipartisan consensus. The argument for lesser evilism is that maybe on some issues, the other side has views and intentions that are considerably worse, maybe even crazy, and it’s worth doing everything possible to stop the other side. Hence, politicians love using negative ads in order to paint the other side as crazy. I try to avoid all exposure to robocalls and negative ads, because I tend to think that politicians who go out of their way to smear their opponents in filth are themselves the filthy ones I don’t want to vote for, and therefore if I see too many ads, I end up not wanting to vote for anyone at all! Today’s election I was going to turn up for, independent of all I have said above, because of the Carnegie Library referendum on a 0.25 mill special tax on all taxable real estate in the City of Pittsburgh to be allocated and used only for the maintenance and operation of the Carnegie Library of Pittsburgh. There are lot of people who don’t like referenda, because as a form of direct democracy it bypasses the overall framework of representative democracy in which we, the people, are supposed to elect politicians to decide matters for us, rather than act as a mob. The upsides and downsides of both forms of democracy are well-known (California’s political system, incorporating both the representative process as well as its infamous ballot propositions, is completely broken). In the case of the Carnegie Library referendum, I’ve heard a lot of very heated rhetoric on both sides of it. This time, at least, I appreciated the opportunity to have a say rather than depend on politicians to decide for me, because I feel strongly about the importance of libraries. The following year, I continued to vote and expect to continue, year after year.